Exterior siding is wonderful for keeping your home attractive, providing curb appeal as well as protection from the elements. But the key to long-lasting, beautiful, durable siding is proper maintenance. With minimal effort and attention, you can help your siding perform at its best. The type of siding maintenance you do—and how often you do it—depends on the form of siding your home features. Here are some tips to help your siding stay beautiful and offer its full protection for years to come. Wood such as cedar provides a gorgeous, natural appearance, which is why many homeowners love it for their siding. But wood is also highly affected by weather, pests, and wear and tear. So, it needs plenty of TLC. Perform a visual inspection at least twice a year, looking for signs of damage, such as termites and wood rot. Wood needs to be repainted or re-stained at least once every five years to ensure it stays protected. If you use a clear sealant, you’ll need to reapply it every two years. Use warm, soapy water and a soft-bristled brush to remove dirt and dust. Remove mildew with a solution of one part bleach to four parts water. While vinyl resists rot and pests, it can get warped or cracked. It can also trap moisture underneath it if it is improperly installed, loose, or damaged—which is common in windy areas like Chicago. A garden hose is usually all you need to rinse dirt and dust from vinyl siding. Vinyl can be damaged by repeated impact from lawnmowers and other heavy-duty items. It can also melt from repeated exposure to heat from barbecues. Keep items like these several yards away from your siding. Vinyl’s color can fade over time. If you do decide to paint it, use a high-quality exterior latex paint in a light color such as white or light grey. Darker colors will draw in the sun’s heat and cause warping. Though fiber cement doesn’t suffer from damage from pests and extreme temperature changes, it still can suffer occasionally from the repeated impact of the elements. Signs of damage can include cracks in or around the siding, damaged paint, warping, and mildew. The strength of fiber cement siding means it can handle being power washed. 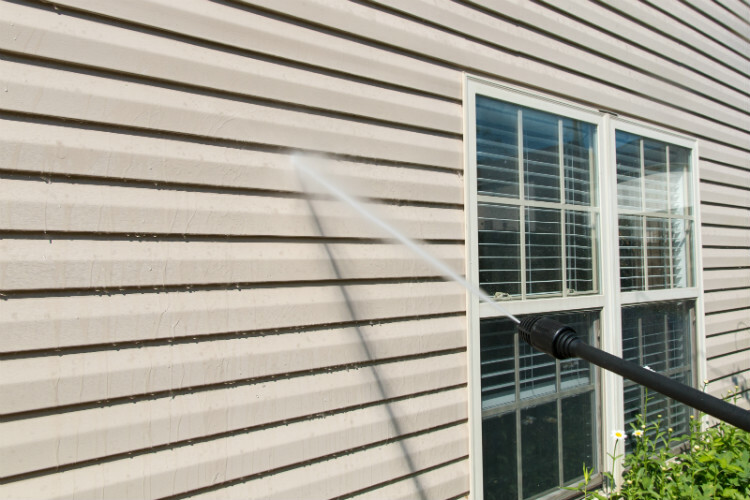 If you don’t have a power washer, you can wipe down your siding with soapy water or rinse it with a hose. Fiber cement holds paint very well, but eventually, you may want to refresh its color. When you do choose to paint, be sure to use exterior-grade acrylic paint. While steel resists damage from weather, if it is scratched or otherwise damaged, it can begin to rust. Power washing is a great choice for steel siding, and you only need to do it once a year. Many homeowners don’t paint steel, but if you opt to do so, you’ll need to repaint whenever the paint job fades. Siding maintenance is well worth the investment. By following these simple, straightforward techniques, you can ensure that your exterior siding maintains its attractive look and feel, and protects the structural integrity of your Chicago area home. And if you have any questions about the condition of your siding, or if you suspect it may be time for upgrades or a replacement of your Chicago home’s siding, the elite team at Siding & Windows Group is ready to assist you any way we can. We offer superior siding installation services, and we guarantee our labor for 10 years. Contact us anytime to learn more about our exterior siding options and add curb appeal and long-lasting protection to your home.